In the Martin & Sylvia: More Adventures! story “Singing Together,” when Mr. Weber invites Martin and Sylvia's family to come downtown to sing wintertime songs at the local shops, brother and sister only think of one thing: they might have to see Mr. Amos. Mr. Amos owns the antique store, and they've heard stories that he is mean and doesn't like children. On the night of the downtown singing, however, they learn how important it is to ignore hearsay and "see for yourself"! 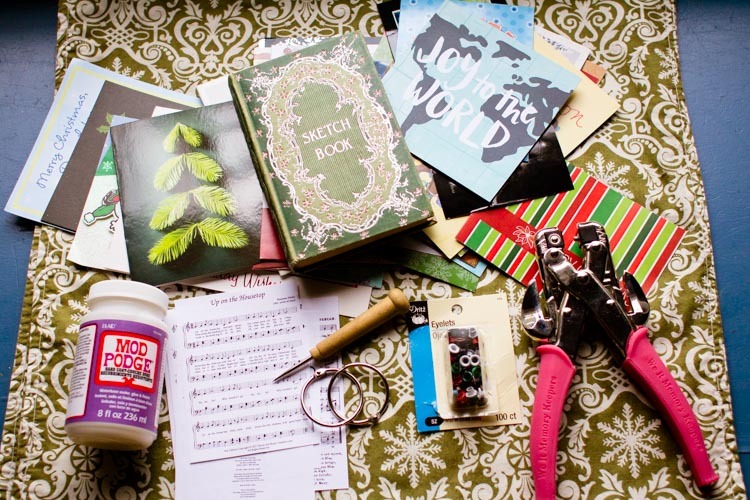 It's a cliché to say so, but music is universal and never more so than during the holidays. No matter what language they're singing in — even if you're a (reputedly) grumpy shopkeeper — it's hard not to smile at an earnest bunch of carolers belting tidings of joy into the cold. I have this Christmas dream of getting my whole family together to go caroling at our friends' houses. Amidst the merry business of the season, I've never quite been able to make it happen, but maybe this is the year, eh? 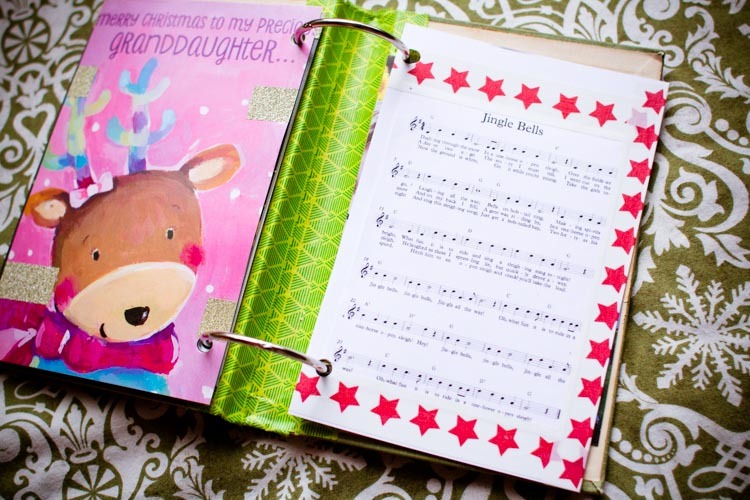 In hopeful preparation, I decided to put together a Christmas songbook for this week's craft project. Made from a vintage book and my pile of old Christmas cards, it's meant to be added to and cherished year after year. 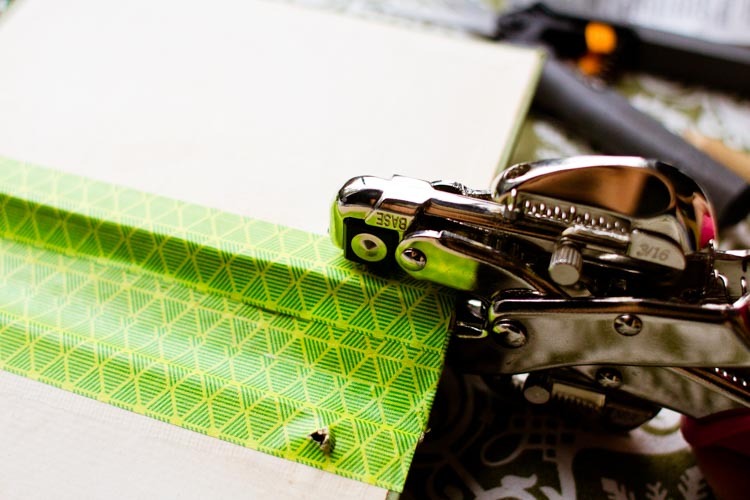 The only real special equipment you'll need to make one for yourself is a packet of eyelets and either eyelet pliers or an eyelet setter. I happened to already own a set of pliers, so I used those. 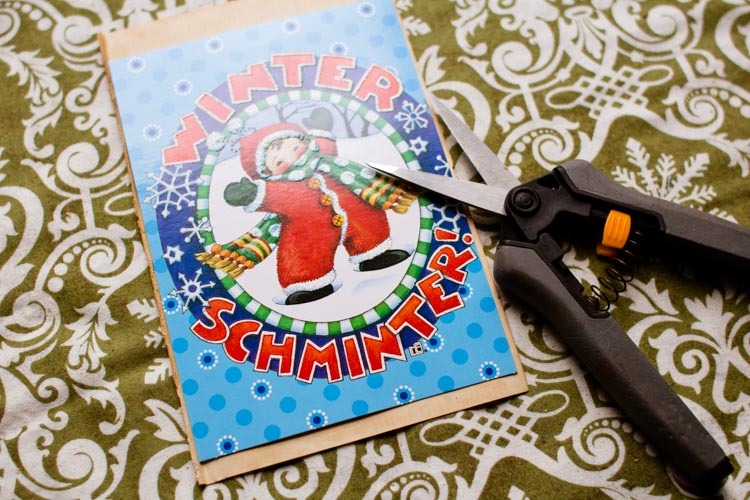 If you don't have pliers, an eyelet setter is less expensive, and is typically sold right next to the eyelets at the craft store. Any small-sized eyelets will work for this project — just make sure you get a setter that corresponds to the size of eyelet you choose. 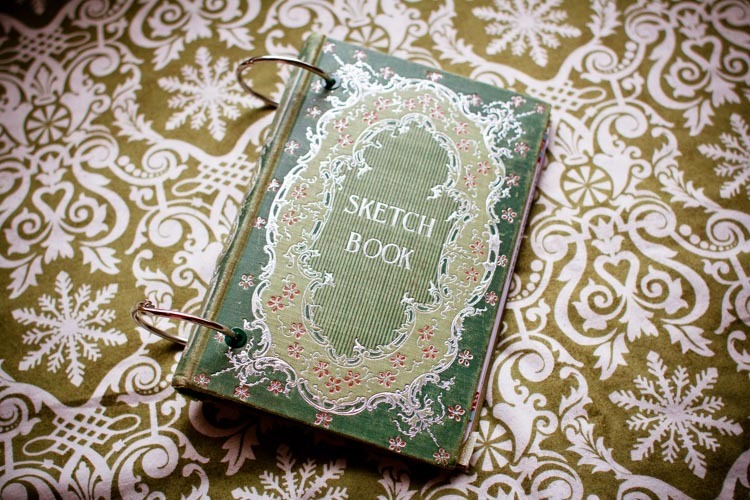 First, head to a vintage bookstore to find an old book with a Christmassy cover. 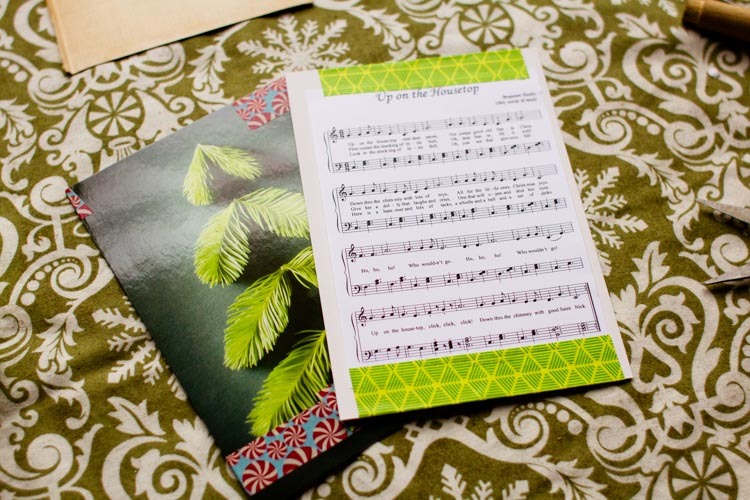 (I fell in love with the tiny one in these photos, but, in retrospect, a larger book would have been better because the small book meant that my sheet music had to be small, too.) 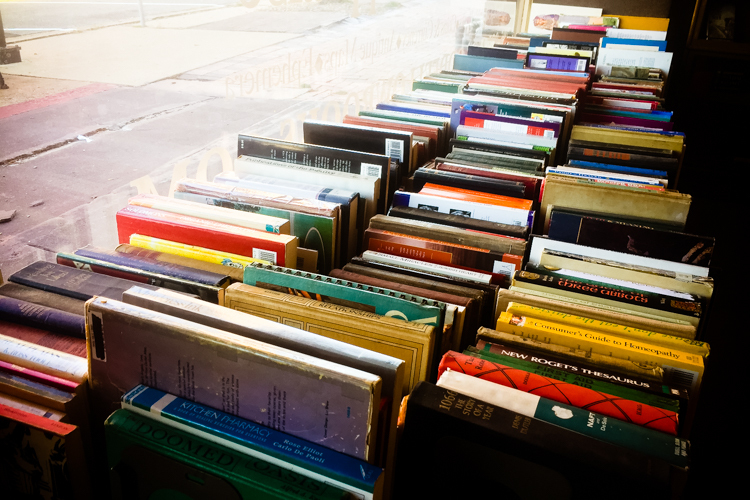 The book needs to have a hard cover and be relatively structurally sound, but otherwise any book will do. 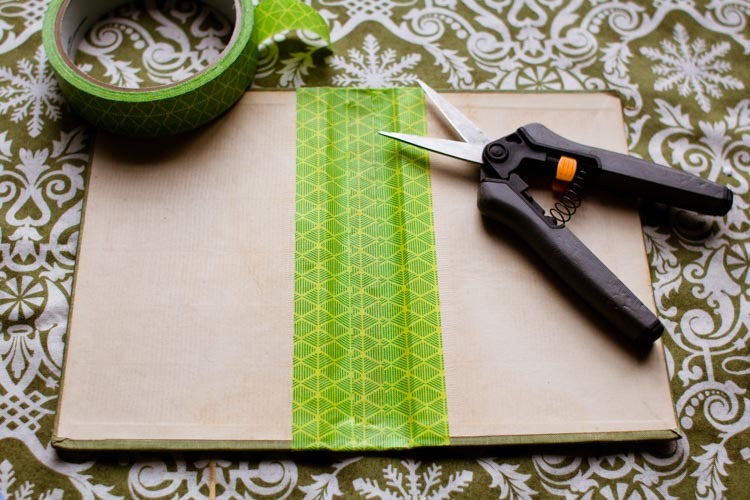 When you get home, use a craft knife to cut out the book's pages and recycle them or save them for another use. 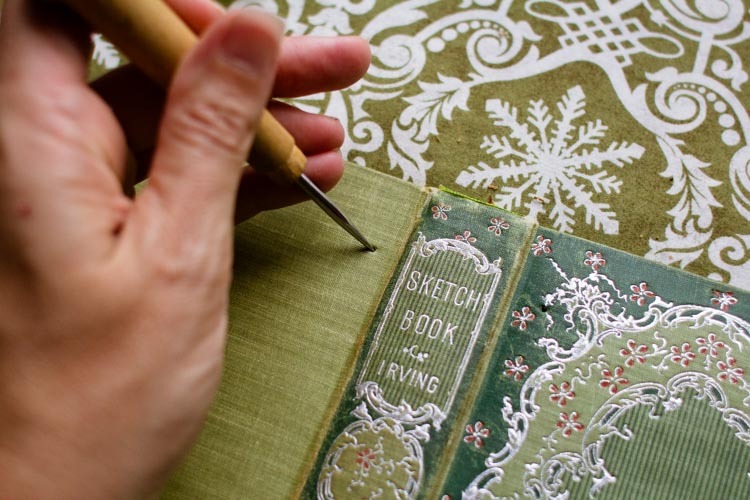 Turning to the book's cover, take some sturdy decorative tape and tape the inside of the spine. Not only does this make the spine look neater, it will also help reinforce it. 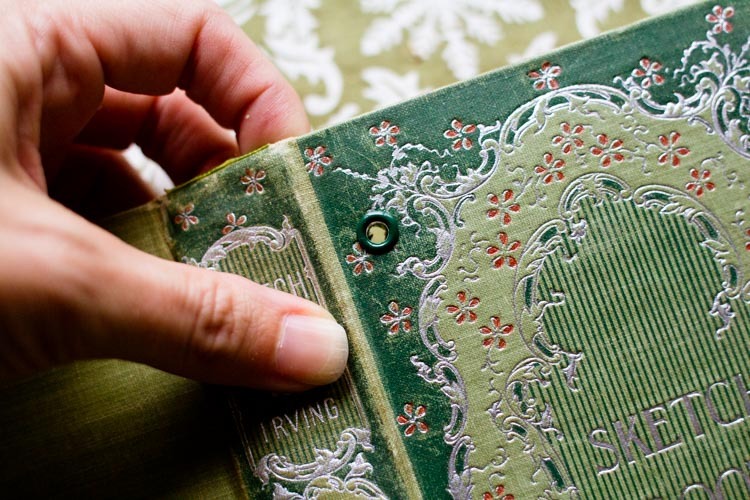 Now, flip the book over, so that the cover is facing you, and use the awl to make 4 holes — one each near the top and bottom of the front and back of the book's cover. Fit an eyelet into each hole, and use the eyelet pliers or setter to crimp down the sides. Put a binder ring through each set of holes. Next, make the pages. 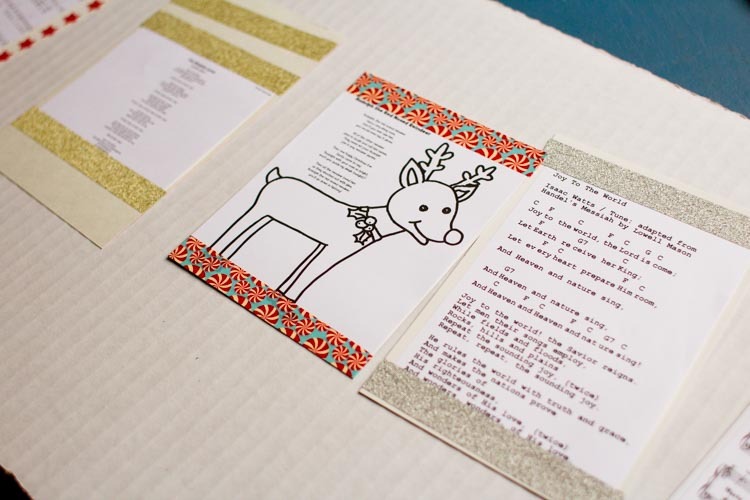 Cut a few old Christmas cards so that they're slightly smaller than the book, then tape or glue the sheet music or lyrics to the cards. 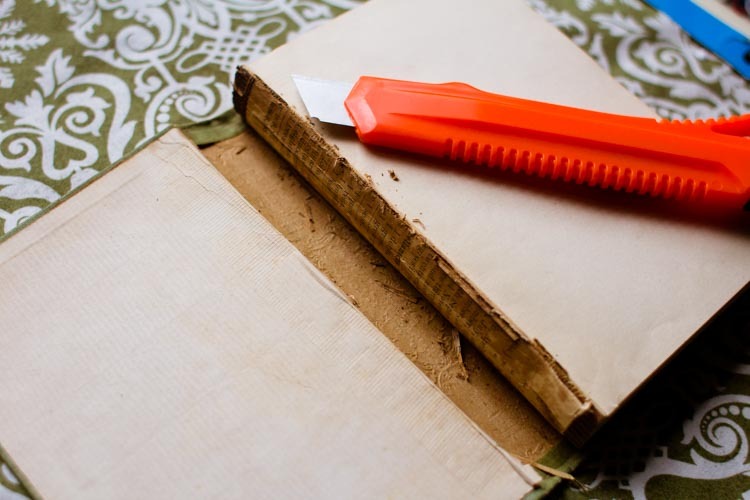 When the glue is dry, use a hole punch to make holes near the top and bottom edges so that the pages will fit in the book. Keep in mind that you can add pages every year if you want to. There's no hurry to make them all at once. 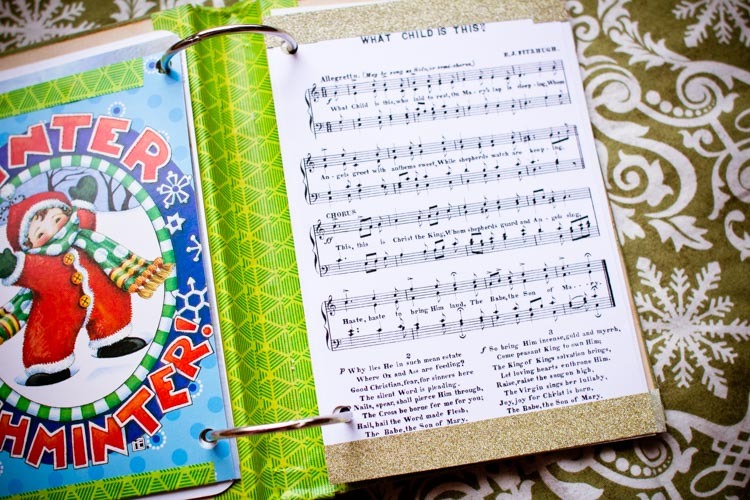 Secure the pages onto the binder rings, and then your pretty song book will be ready for caroling! About Martin & Sylvia: More Adventures!